We seem to be much too preoccupied now with solar power as a great form of alternative energy. But way back in 1931, Thomas Alva Edison had a tête-à-tête with Henry Ford and Harvey Firestone, opening his heart to the forerunners of automobile industry and said, “I would put my money on the sun and solar energy. What a source of power! I hope we don’t have to wait until oil and coal run out before we tackle that”. But we had to wait for 70 odd years, before Edison’s brainstorm materialized into a modern solar panel. Yet retrospectively, what have we actually achieved? The sun supplies enough energy to our small planet in one hour to satisfy all of our energy needs for a year whereas solar power provides less than half of 1% of our residential energy needs. But all that has started to change – and that is the good news. Solar power is derived from Photovoltaic cells or solar cells that can transform the sun’s light energy into electric current by processing the photons. As light strikes the PV cell, a portion of it get absorbed in the semiconductor. As a result of this, the electrons loose their footing and starts roaming freely. The electric fields within the PV cells then guide the freed electrons to flow in a chosen direction which forms the energy. When several PV cells are electronically bound together, they form a module while several modules in an assembled form make photovoltaic or solar panel that generates electricity for our homes or workplaces. 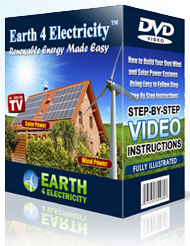 Electricity is also available from another form of alternative energy resource like the wind. Of course, here the method applied is rather simple though its application may not be so. First of all, the device that will generate electricity has to be installed in a site where the wind should blow at a certain speed in a steady stream. Though the device is called a wind turbine, in reality it is nothing but a small motor with a high rated capacity and having a blade attached to its shaft. Unlike a solar panel that does not have any moving parts and is a silent worker, the turbine must run at a high speed to generate the desired amount of power. To avail uninterrupted supply of electricity, people often use both solar panel and wind turbine together. Throughout the day, when sunlight is plentiful but wind flow is low, the solar panel provides the desired current but when the sun goes down, the nightly high wind helps run the turbine that does its duty fully. But when you connect your solar power system to the grid, you can get electricity even in the night. Are you ready to install a solar power system? No you do not need an expert for this – you can do it yourself provided you know a few basics such as the best place to set it up, know all about the installation and wiring, and can find out the best places for cheap parts. Plus, you will also need to know the safety precautions. The cheap solar panels will save your electricity bills and also contribute to clean up the environment.